If you are interested in explore the different dimensions of your karma, we recommend you to start first of all by ordering the Birth chart report. It is like looking into all the seeds that you brought at the moment of you birth, the potentials of your life. 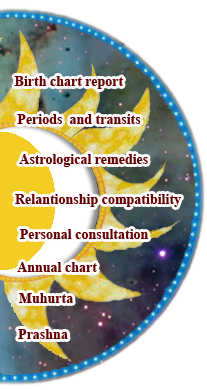 After having your birth chart, we recommend you to order the analysis of planetary periods and transits report. This is the more dynamic aspect of your chart, it shows when in your life the different karmas and potentials that are shown in your birth chart will tend to manifest with more strength. It is more a predictive tool. We will focus in the present time and in the future 4-5 years, to give you a perspective of what are the main issues at this time of your life and when some changes are expected and in which direction your life is going. You will also see the ups and downs in the different areas of your life according to the main change in the position if the planets in the sky, the main transits. After you got those, you can go further and have a yearly annual chart to see the main trends of one year at the time, going more into short term changes, ups and downs within a particular year. This is an interesting analysis to e done yearly at around your birth day, or the beginning of each year. Other important report is the relationship compatibility, which shows the astrological “chemistry” or mutual influences that you have with the significant other people in your life, especially with your spouse or love partner, but it also an interesting phenomena between friends and relatives or business partners, showing how compatible you are for different areas of life. If you are planning to start an important activity that is going to have an important effect for many years in your life, it is good to choose an auspicious astrological time. There is a good and bad time for different kind of activities. The time that you start an action will have an effect in the result of the action. This electional astrology is called Muhurtha. Sometimes you just have an important question, something very relevant that is going on in your life, some important decision that you have to take, then, even without knowing your birth time of date, we can do a Prashna chart, the chart of the moment of the question. There is a synchronicity in the universe and nothing happens independently from anything else. The moment that you ask a question is not by accident or chance, Analyzing this time of the question can bring you very interesting insights into the topic of your concern. This also useful as a general astrological consultation for those who don’t have a know or accurate birth date and time. Please feel free to contact us for advice if you have doubt of what kind of report to order. Reading our free articles section will also help you to understand more the purpose of Jyotish and the elements we use. Copyright © by Jyotish9graha, all rights reserved. Content, graphics, and HTML code are protected and may not be copied, reprinted, published, translated, hosted, or otherwise distributed by any means without explicit permission.